Powerful gaming tribes' "control" of the Legislature is behind lawmakers' opposition to recent tribal-casino agreements negotiated by his administration, Gov. Schwarzenegger said Tuesday. "What has happened is that every time we come to agreement on a compact, we have the big tribes lobby up here and they control the legislators," Schwarzenegger said. The governor spoke during an afternoon of interviews with Capitol reporters for The Press-Enterprise and other newspapers. He touted his "year of reform" agenda on the November special-election ballot. 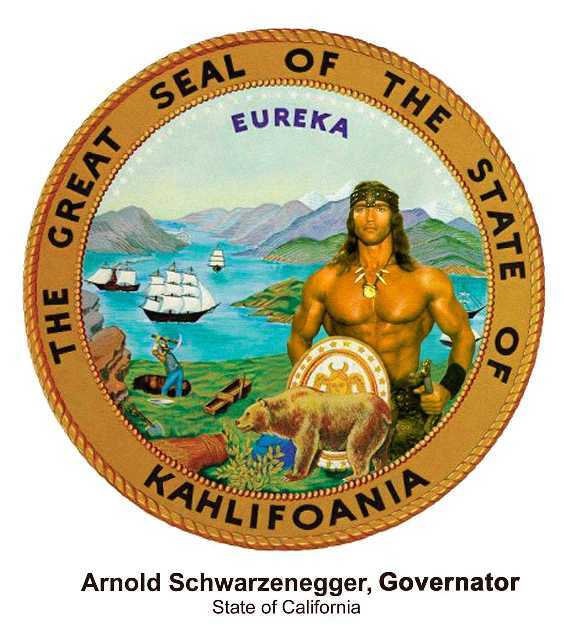 Campaigning for office in 2003 with a promise to extract a "fair share" of tribal-casino revenue for the state, Schwarzenegger confronts a Legislature that seems increasingly skeptical of his efforts, particularly among fellow Republicans. Tuesday, the governor accused wealthy tribes with casinos — most of which are from the Inland area — of trying to squelch competition. "They lobby and they tell them not to vote for them. They don't want the little tribes to build a casino that's maybe 70 miles away from them," he said. Representatives of Inland gaming tribes were not immediately available for comment. Assemblywoman Bonnie Garcia, R-Cathedral City, helped marshal opposition to two of the governor's recent compacts. Through a spokesman, she did not respond directly to the governor's remarks. "I feel that in taking the time to adequately vet out the compacts the governor negotiated, I as a legislator am fulfilling my commitment to the voters of this state when they approved Prop. 5 and Prop. 1A," Garcia said, referring to ballot measures that legalized Las Vegas-style gaming on tribal lands. An agreement announced in June would have allowed the Yurok Tribe — the largest and among the poorest tribes in the state — to open a casino on its reservation along the Oregon border. Another deal would permit the Quechan Tribe of the Fort Yuma Indian Reservation to install more slot machines in a new casino on its reservation in the southeastern corner of Imperial County. Inland tribes led the opposition to the agreements. Critics — including the Morongo Band of Mission Indians near Banning and the San Manuel Band of Mission Indians near Highland — said the deals included unfair concessions to the state. Inland tribal leaders view the agreements as an unacceptable template for negotiations to lift a 2,000-per-tribe cap on slot machines. They say they don't fear competition. On Sept. 9, the administration unveiled two more compacts. They would allow a Humboldt County tribe and another in San Diego County to build a two-casino complex in Barstow, with up to 4,500 slot machines. Lawmakers and Inland tribes have slammed those deals because they would allow the tribes to build casinos far from their reservations. Schwarzenegger said he expects to compromise with the Legislature on his compacts after lawmakers return in January. It is easy for Gov. Schwarzenegger to attempt to dispense with certain Indian tribes by asserting that their success has clouded their ability to be a clarion for sound public policy. "Wealthy tribes 'control' lawmakers, governor says" (Sept. 21). Rather than criticizing California lawmakers by suggesting that they are under the control of wealthy Indian tribes, Schwarzenegger should be applauding California lawmakers for having the courage to safeguard the state's public policy on gaming as approved by 64.5 percent of the electorate in March 2000. The vote of the people on Prop. 1A followed a gaming compact signed in 1999 by 57 Indian tribes. The essence of the existing policy on casino-style gaming is that a limited scope of gaming conducted by Indian tribes on Indian lands is acceptable public policy in the state. Initiating "reservation shopping" by moving tribes far from their existing reservation lands to conduct gaming is a blatant disregard of the will of the people. The objections I expressed in Press Enterprise: Casino Tribes Blocked Gaming Compacts also apply here. See that posting for a critique of the "control" argument. In summary, state legislators who support tribal sovereignty have every reason to oppose the giveaway compacts. Gaming tribes such as Pechanga and San Manuel are adamant about preserving their hard-won sovereign rights. These tribes already face substantial competition in their region, so more competition isn't likely to faze them. But they don't compete on the Oregon and Arizona borders, where the new casinos would've been located. And if gaming tribes "control" the Legislature, why can't they pass the laws they want enacted? In short, Schwarzenegger's claims don't stand up to scrutiny. They're political posturing, which is what we've come to expect from our muscle-bound governor.